What is the purpose of M1324? Identifies the stage of the most problematic stageable pressure ulcer. Please note; ulcers that have healed are not considered for this item. When is the assessment performed? Terminology referring to “healed” vs. “unhealed” ulcers can refer to whether the ulcer is “closed” vs. “open”. Recognize, however, that Stage 1 pressure ulcers and Suspected Deep Tissue Injury (sDTI), although closed (intact skin), would not be considered healed. the wound bed is obscured by some degree of necrotic tissue AND no bone, muscle, tendon, or joint capsule (Stage 4 structures) are visible. Note that if a Stage 4 structure is visible, the pressure ulcer is reportable as a Stage 4 even if slough or eschar is present. “Most problematic” may be the largest, the most advanced stage, the most difficult to access for treatment, the most difficult to relieve pressure, etc., depending on the specific situation. If the patient has only one stageable pressure ulcer, that ulcer is the most problematic. Enter the response that most accurately describes the stage of the most problematic stageable pressure ulcer using the definitions of Stage in M1311 that were derived from the National Pressure Ulcer Advisory Panel (NPUAP) staging system. 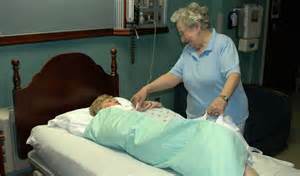 Enter “NA” if the patient has NO pressure ulcers or only has pressure ulcers that are Unstageable as defined above. Do not reverse stage pressure ulcers as a way to document healing as it does not accurately characterize what is physiologically occurring as the ulcer heals. For example, over time, even though a Stage 4 pressure ulcer has been healing and contracting such that it is less deep, wide, and long, the tissues that were lost (muscle, fat, dermis) will never be replaced with the same type of tissue. Clinical standards require that this ulcer continue to be documented as a Stage 4 pressure ulcer until it has healed. If a pressure ulcer is Stage 4 at SOC and is granulating at the Follow-up Assessment, the ulcer remains a Stage 4 ulcer. Wound bed completely covered with new epithelium. No avascular tissue (eschar and/or slough). No signs or symptoms of infection. Wound bed filled with granulation tissue tthe level of the surrounding skin. ≥ 25% of the wound bed is covered with granulation tissue. < 25% of the wound bed is covered with avascular tissue (eschar and/or slough). Nsigns or symptoms of infection. Persistent failure timprove despite appropriate comprehensive wound management.